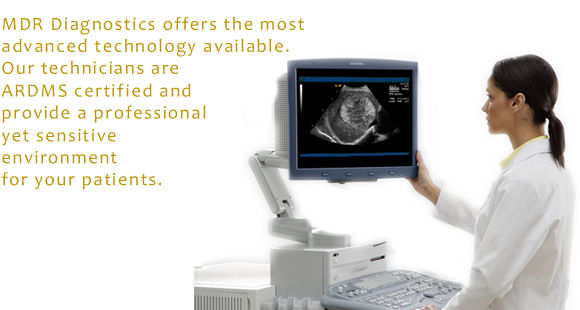 diagnostic ultrasounds capabilities to your office. We move in, we move out, same day. Testing performed in your office allows for your patient to receive quality service while increasing productivity and necessary diagnostic services for your community. Patient reports are sent by email or fax (according to preference) directly to your office. Copies of the reports are sent to the institution, attending, & referring physicians. A complete signed report to follow within 3 business days. MDR Diagnostics offers the most advanced technology available. Our technicians are ARDMS certified and provide a professional yet sensitive environment for your patients. We accommodate your scheduling needs by providing our services right in your office.